Stretch Your Horse App Users Get Real Results....Usually in 2 Weeks or Less!! For 22 Video Bundle Purchases!! Doing the 3 stretches you learned is great! It really is!! Seriously.....No BS!! You've proved that with a bit of practice, you are fully capable of learning to stretch your horse! How cool is that! most of your horse's 700 skeletal muscles? A reduction in your ability to do your job, enjoy riding and perform other life activities. The consequences are exactly the same for your horse if you only stretch some of their muscles! ​That is why I created the Stretch Your Horse App! 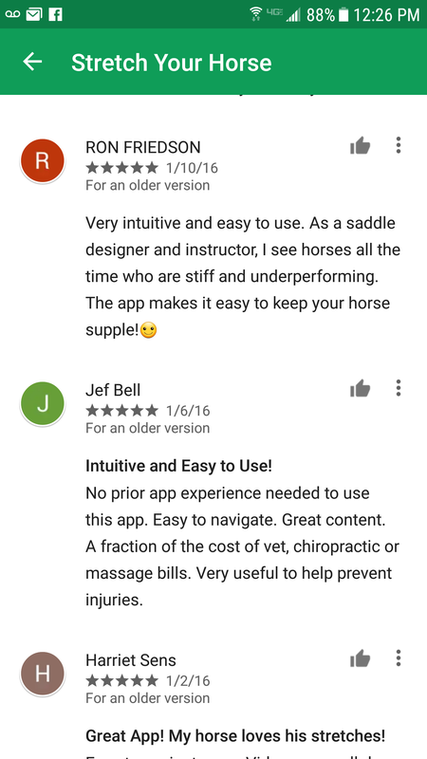 The Stretch Your Horse App is Veterinarian and Trainer Endorsed! Stretches He or She Needs! 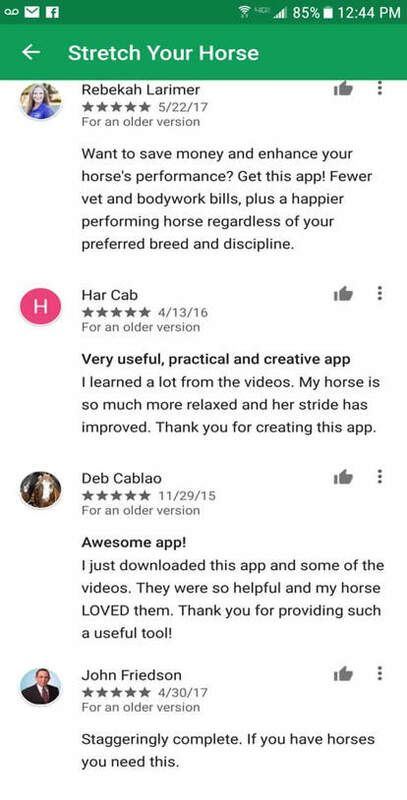 Check Out What's Inside the ​Stretch Your Horse App! 25 video tutorials. 3 free videos included. Stretches for the hind end, front end, core/back, head and neck. 2 bonus videos: Girthy or Cinchy Horse Solutions helps you solve this vexing problem and teaches you a great massage move every horse needs to help prevent girth or cinch pain and muscle damage. Click here for more details about all the videos in the Video Library! 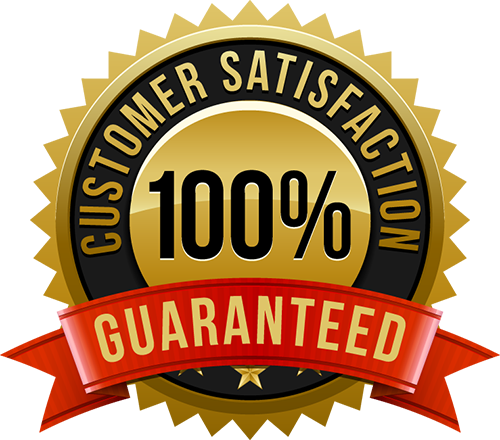 Contains an image and detailed description of each stretch, ratings and reviews. Contains all the videos you purchased and downloaded. Videos available with or without cell or wi-fi connection! Rate and review the videos! Access to Color-Coded Anatomy Pictures, Support, Stretching Guidelines and more! SYH App costs only $0.99 (99 cents USD) and comes with 3 free videos! That's a 66% savings!! Video bundle containing 22 videos costs only $69.99! That's a 20% savings! Check out my article in Natural Horse magazine to learn more details about why stretching is critical for your horse's health and longevity. 1. ​​​Click on the Google Play or Apple App Store image below from your iPhone or Android phone. 2. Purchase and download the SYH App. It only costs $0.99 (99 cents USD) ! 66% savings! 3. Browse the Video Library. Purchase all the videos in one convenient bundle for only $69.99. 20% savings! Viola! Start Stretching Your Horse!! Need Help Buying the SYH App? Stretch Your Horse App Users Get Real Results....Usually in 2 Weeks or Less! Buy the Stretch Your Horse App Now! 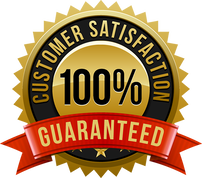 14 Day 100% Money Back Guarantee on 22 Video Bundle Purchases! ​​Vet, Trainer, Rider and Horse Endorsed! Fast results! Usually in 2 weeks or less! No cell service or wi-fi connection needed! Access the videos right at your horse’s side anytime, anywhere! ​App costs $0.99 (99 cents US). ​Click on the Google Play or Apple App Store image below from your iPhone or Android phone. ​Purchase and download the SYH App. It only costs $0.99 (99 cents USD)! ​Need Help Buying the SYH App? Want Your Horse to Remain Healthy? Discover How Stretching Can Save You Hundreds of Dollars and Help Keep Your Horse in Top Shape and Pain Free! See how he gained over 4 inches of stretch (range of motion) in 2 weeks by doing hind leg stretches! It improved his comfort, gait transitions and circle work! ​Always Be Confident About Doing the Stretches Correctly! Play the Videos Right at Your Horse's Side! Stretch Your Horse is a mobile app designed to teach riders, vets, farriers and trainers, how to safely and effectively stretch their horse's muscles, even if there is no cell service or internet connection. Learn to stretch your horse for a fraction of the cost of a vet or bodyworker bill. The SYH App contains 25 "how-to" stretching videos available as "in app" purchases. ​Stretch Your Horse App costs $0.99 (99 cents US). Want to Show Your Horse Some Love? 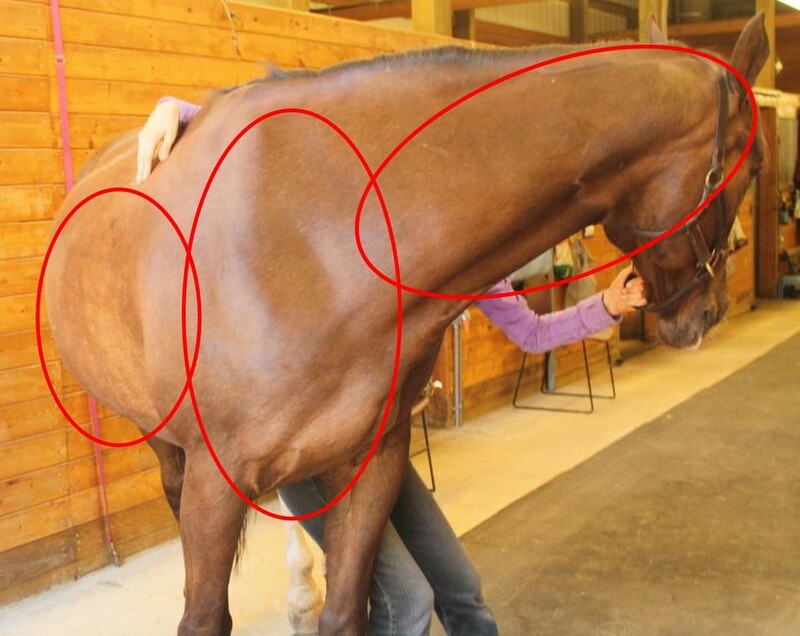 Each horse has different areas of muscle tightness that need attention just like humans! 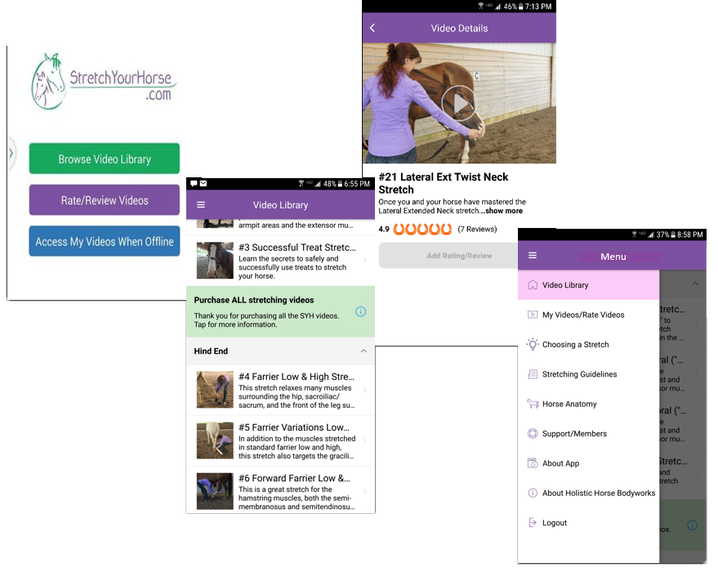 The Stretch Your Horse App Video Library contains detailed stretch descriptions to help you choose the right stretches for your horse. ​The SYH App also contains color-coded horse muscle images so you can see what muscles are being stretched and the ​Top 10 Horse Stretching Guidelines to help ensure you do each stretch safely and your horse gets the maximum benefit. Invest in Your Horse's Well Being! Purchase the SYH App for just $0.99. (99 cents US) Purchase includes 3 free videos. Requests for refunds must be made within 14 calendar days of purchase of the video bundle. Email requests to SYH Support. Refunds will be sent via Paypal for iPhone users. Refunds will be issued to your payment method (credit card etc.) used to make the SYH App and bundle purchase for Android users. Refund methods are different because Apple does not provide an App Store refund mechanism. Refunds not available for SYH App only purchases or individual video purchases.